Because Franklin Open Streets is so big, the Minneapolis Bicycle Coalition is shooting to get 162 volunteers for the day. We need your help to recruit a volunteer force! Please share this link with your networks and encourage your friends, family, soccer team, knitting club, and whatever other rad groups you are a part of to get involved on Franklin! 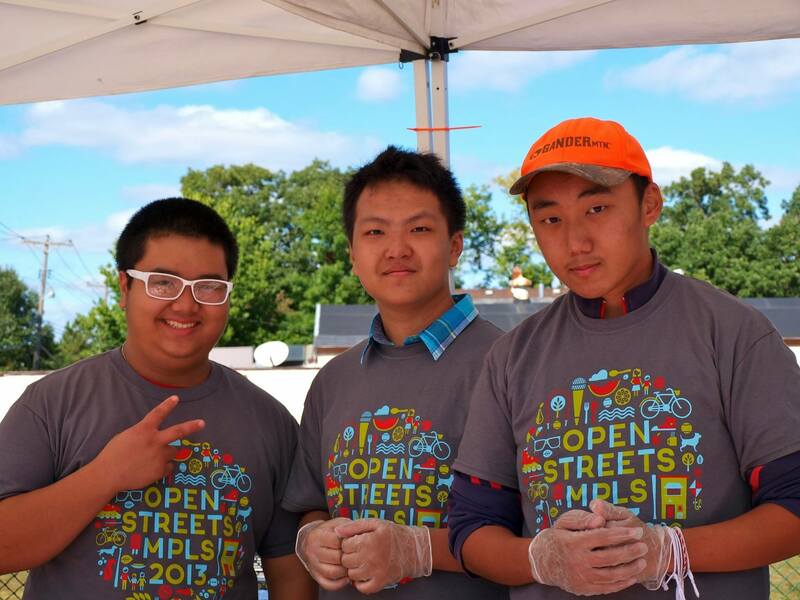 Volunteers put in just 2.5 hours of volunteer work or less in exchange for a free Open Streets T-shirt. Volunteers also get to choose what they do and when they do it — anything from making chalk art at intersections to talking with people about protected bikeways, breaking down tents, taking photos or helping to keep the streets clean and car-free. See the sign up form for a full list of opportunities and times. Thanks for spreading the word! Solcana CrossFit hosts a monthly community council meeting, open to anyone who is interested in furthering community building projects in the Seward Neighborhood and surrounding area. The mission of Community Council is to pursue projects and events that positively affect the health and fitness of Minneapolis. Currently, Solcana CrossFit provides a free twice-weekly class to low-income teens, and the Community Council is tackling the issue of funding this program. If you have insights to offer, or can contribute your perspective on a project, please attend. Coffee will be provided! The Seward Soloprenuers met mid July for a tasty potluck picnic in Jenny Larson’s backyard. The group will be taking the month of August off, but will meet again on Sept. 24, 11 am at Boneshaker Books. We will be brainstorming topics we want to cover this fall as well as hearing from members about the challenges and joys of working independently. If you are a solo business owner in the Seward & Longfellow community and want to connect with other individuals in the field, get involved in the Soloprenuers group by contacting Jenny Larson at jenny@jenniferlarson.net. This summer has seen an increase in business and car thefts in Seward Community. Businesses are reporting items being stolen from their offices, and some stores have even had to stop carrying certain items due to the clientele that the products attract. Restaurants have been having trouble with staff and customers’ cars being broken into. Please take every measure to eliminate any chance and opportunity to become a victim of theft or any other crime. This includes securing doors/windows (house, car, garage, etc. ), keeping valuable items out of site in your car, and most importantly calling the police if you see something suspicious.